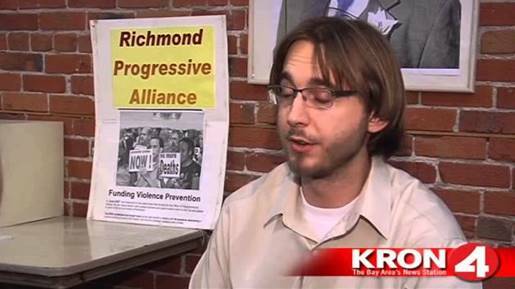 Recently, Richmonders were treated to a rare public flaying of the Richmond Progressive Alliance by one of its most stalwart members, Zak Wear, a long-time member of the RPA’s inner circle, its elite Steering Committee. In this long, two-part surreal dialogue, Wear is in the RPA Headquarters across the street from Richmond City Hall on Macdonald Avenue having a conversation with another RPA Steering Committee member, Kabir Kapur, who happens to be Field Director at Jovanka Beckles for California Assembly District 15. Wear is recording the conversation as a video while he sits or wanders about the room. Kabir Kapur apparently lives at the RPA storefront headquarters. As the conversation proceeds, Kapur is in bed but eventually gets up and pulls his pants on before taking to his bed again. After coming to Richmond some six years ago and falling in with the RPA, Wear is experiencing a severe case of buyer’s remorse. In his diatribe, he continually refers to the RPA leaders’ narcissistic tendencies. The dictionary defines narcissism as “vain, self-loving, self-admiring, self-absorbed, self-obsessed, conceited, self-centered, self-regarding, egotistic, egotistical, egoistic; full of oneself,” which is a pretty apt description. Don’t take Zak’s word for the narcissism label. Read Gayle McLaughlin’s book, “ Winning Richmond: How a Progressive Alliance Won City Hall a two-term Mayor of Richmond CA.” About her book, Gayle writes, “I led a successful grassroots movement to liberate our city from the grip of corporate giants and wealthy special interests. Our progressive transformation returned political power to our residents and local businesses and we defeated the oil giant Chevron’s attempts to buy our democracy.” According to Gayle, she and the RPA single handedly saved Richmond from an otherwise horrible fate, and her self-congratulatory book provides an exquisite, 12-year blow-by-blow detail, the gospel according to Gayle. Zak is a very intelligent but somewhat eccentric guy. He actually worked on my campaign for a couple of weeks in 2014 because he is good with numbers and data and liked the fact that I was not a Chevron candidate. In his nearly hour-long rant, Wear describes the RPA as an “abusive family.” He picks out the old white lefties like Juan Reardon, Marilyn Langlois and Mike Parker, comfortable in their own economic status while pretending to be “working class,” who rule the RPA like a cult, expecting and enforcing discipline, including threats to excommunicate those who stray from the reservation like Ben Choi and Ada Recinos for supporting the Pont Molate settlement. To make things right, Wear says he is starting his own progressive movement, “Reboot Richmond,” and will run for mayor to lead us to his own vision of the Promised Land. One of his first initiative will be to put robo-cops on the street that are programmed to be friendly and helpful. Meanwhile, he plans to apply for a seat on the Planning Commission to replace Marilyn Langlois. The only thing that is puzzling is how long it took a smart guy like Wear to figure this all out. Far from saving Richmond, the RPA is the most dangerous thing that ever happened to Richmond. These clueless armchair liberals sitting around Gayle’s (or someone’s) kitchen table managed to lose the Global Campus, almost lost Point Molate (but just lost a few tens of millions of dollars instead), lost us entire affordable housing projects, and are always looking for the next failure they can foist on our city and then spin it as a victory. Having elected a supermajority of RPA members to run Richmond, voters apparently prefer a different drummer, and Zak might be the next, less vain, future of Richmond.